Home Grown is a 20-minute short film I created and directed at Nordisk Film. It's a combination of miniature sets and 3D-animated characters. The film is inspired by abandoned cities, such as Chernobyl and Fukushima, where nature has been able to regain dominance. The story revolves around DARYA, a 13 year old girl who returns to her city of birth to find her father. Her friend INGEBORG attempts to fill out Mira’s hole with vodka and parties, but they meet the 500 year old shaman ULRIK, a more holistic solution arises: Mira must find her inner power animal to regain her strength. But after being put into a drum-induced trance, Mira meets something entirely unexpected. Watch the final film below. Be sure to click the 'CC' button to get english subtitles. Whole was created over a period of a year, from script writing, to storyboards and animation production. We started off by being inspired by how shamans communicate with power animals and fleshed out the story from there. In production, we used a combination of techniques to create the film, including photo's, camera mapping, sterescopic 3D and 3D-printing. We made use of Blender for animation, it's render engine Cycles for rendering, as well as Shapeways for 3D printing and the Renderstreet.st as an online renderfarm. Model sets were photographed and mapped onto the backgrounds. 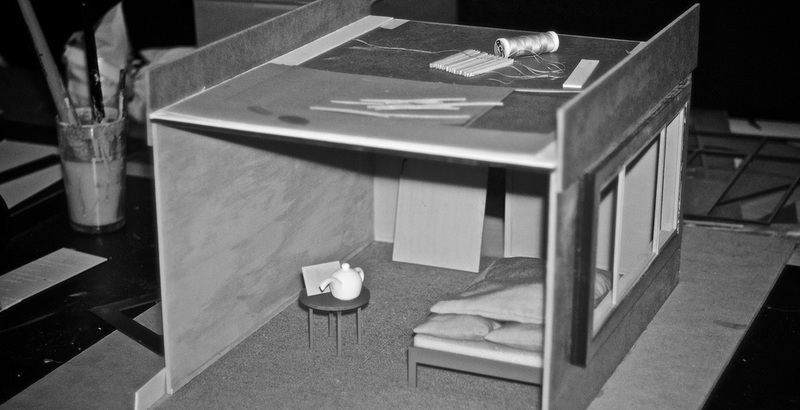 Models were 3D-printed and placed inside the sets for lighting reference and size comparison. We used a combination of lazer-cutting and 3D-printing to assemble the sets. Camera mapping was used to project the photos onto 3D surfaces. Click any of the characters below to download the file. Open them and manipulate them using the free 3d software Blender.